Balsamic Vinegar derives it’s name from Balsam or Balm. 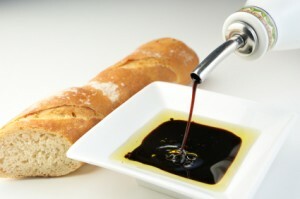 Balsamic Vinegar has been treasured for it’s curative properties for hundreds of years. Prior to the commercial success of Balsamic Vinegar this syrupy sweet condiment was relatively unknown outside of the Emilia-Romagna region of Italy. Since the 18th century the term “balsamico” refers to that regions special vinegars that are aged in wood barrels. The actual origins of Balsamic Vinegar have been traced back to the 11th century where Balsamic Vinegar was used as a drink to cure plague. Balsamic Vinegar was so treasured that it was a product only available to the ruling class and aristocrats. It was also viewed as a treasured family possession that was to be passed on as an inheritance. Balsamic Vinegar was a well kept secret until the late 1970’s . As a result of the rapid growth in popularity many imitation products were introduced to the marketplace. There is a significant difference between true “Balsamico Tradizionale” which can run in the hundreds of dollars per bottle and readily available commercial grade Balsamic Vinegars which can run just a few dollars. Next post: Balsamic Vinegar or Balsamico Tradizionale, What Is The Difference?